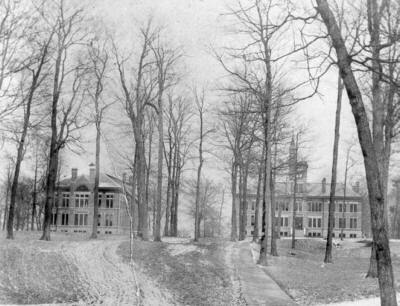 Owen Hall and nearby Wylie Hall were the first buildings built on the new Indiana University campus, after the fire of 1883. The fire had destroyed the main building of the earlier campus, and a new location, then called Dunn's woods, was chosen for the new campus. There, on April 2, 1884, ground was broken for the two new buildings, designed by Indianapolis architect George W. Bunting. Thus, Owen Hall and Wylie Hall were once the only two building of the University, seen here in a picture dated 1885. Owen Hall is on the left. Photograph courtesy of Indiana University Archives. Owen Hall is named in honor of Richard Owen, who upon becoming the Indiana State Geologist in 1860, became also, by law, a professor of geology at Indiana University. From the first day of 1864 until 1879, Owen served as Professor of Natural Science at the University. Originally, Owen Hall housed the Department of Natural Science and the Museum. In later years, many other departments and offices were located there. 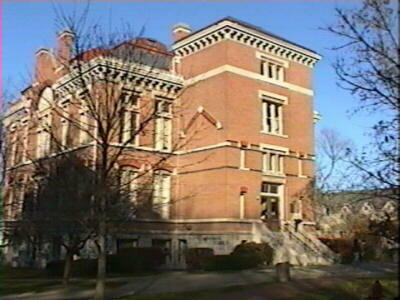 At the time of this image, in 1998, Owen Hall housed the University Chancellor's Office.